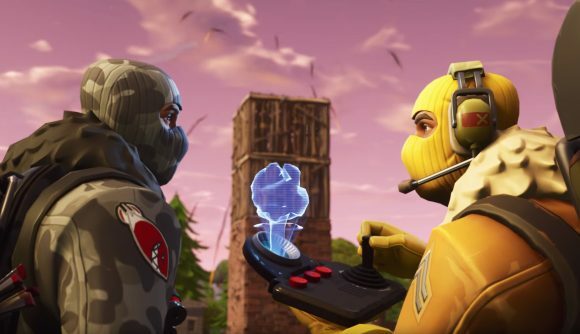 We’re not all that far from the end of Fortnite season 5, so it’s time for the fan theories to run wild. As always, the end of one season means the beginning of another, and Fortnite Season 6 promises to usher plenty of map changes. But while those are, more often than not, a bit of a surprise, some enterprising fans think they might have already uncovered one change. Fan Twitter account FNBRLeaks seems to be of the opinion that either Loot Lake, Salty Springs, or Pleasant Park is set to be removed or modified in the new season. Their reasoning is relatively lengthy, and in some places somewhat tenuous, but it also points to the name of a potential new named location – Crazy Castle. The castle seems like it might have been teased in the promo for a new emote. Capoeira was posted to the game’s official Twitter on August 25, and shows a character performing the emote. What’s more interesting, however, is what some eagle-eyed players have spotted in the background. If you look towards the right-hand side of the video posted in the tweet below, you can see the blurry outline of what looks a bit like a medieval castle. Exactly where that might be is up for debate, but the outline of the surrounding hills points at the area between Loot Lake and Pleasant Park. If that seems like a bit of a reach, I understand. However, it’s worth also pointing out one of the sprays added to the game at the beginning of Season 5. As it so happens, that’s called Crazy Castle, and it seems to match up with the blurry image in the video above. Crazy Castle does seem like it would fit the alliterative theme of the Fortnite named locations, but it would also follow two other sprays in heralding the arrival of new in-game content. Both the Laser Chomp and LuchaGG sprays have similar items available for purchase. Fortnite Season 6 is still a while away, so we’ve got a while to wait until we find out what’s in store for the new season. Until then, you can either keep an eye on the antics of the Fortnite cube, or work to complete the Fortnite week 8 challenges. Or, you know, you could go outside, or something. It’s up to you.